An opportunity to enjoy seasonal changes with autumn bird life and wild ibex to spot. Routes weave in and out of the deciduous tree-line, under canopies of holm and pyrenean oak and Spanish chestnut, as well as climbing to 2500m, gaining stunning views out over the Mediterranean towards Morocco. On Saturday evening - arrival with welcome drink, meal and accommodation at family hotel Orgiva. 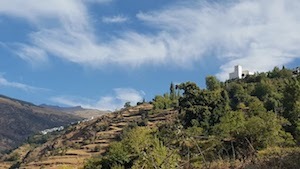 On Sunday The route follows the recently created Sulayr long distance path (GR240) which circles the Sierra Nevada range taking in high pastures, woodlands and ancient acequias (Moorish irrigation channels) arriving in the pretty whitewashed village Capileira mid afternoon. On Monday we walk up the high valley above Trevelez village. This is an area with no metalled roads or even forestry vehicle tracks where the vaqueros take their herds up to the alpine regions in early summer returning in the autumn when the weather cools. Our route follows the caminos and cañadas (mule paths and drovers' routes) past the tree-line to over 1900m. On Tuesday we ascend to Pico Alegas at 2100m gaining views of the glacial cirques that fall from the highest peaks of the Sierra Nevada and descend into the high, hidden valley of the Toril with its high pastures and mountain streams. On Wednesday there is a free morning to enjoy Capileira with its maze of tiny cobbled streets tumbling down the steep mountainside. Don't miss the chocolate and ice cream factory and the craft shops! At midday we take a picnic with a half-day walk arrive at the Refugio Poqueira at (2500m) where we stay the night. Friday is our last day of walking and we take the Sulayr path once more: climbing from Capileira up into the park, gaining stunning views out over the Mediterranean, passing waterfalls at Tajo de Cortes, circling back to the Poqueira valley on the GR7 long distance path and visiting the Berber-style whitewashed village of Pampaneira, with its shops and visitor centre. in Orgiva where the last night is spent. Accommodation: shared twin or double rooms in small family run hotels - single supplement €15 per night. What's included: accommodation, all food (except Friday supper) including picnics with home made bread and locally sourced products, walks led by guides who live in the Sierra Nevada, transport from our meeting place in Orgiva and throughout the week. GRADING: MODERATE:- Either fairly easy medium-duration walks or harder, shorter walks. No experience is necessary, but good health and reasonable fitness are important. Some walking at higher altitude and occasional longer/harder days may be involved, but general underfoot conditions will be fair. A walking day is normally five to seven hours, with around 4 hours of actual walking time and daily ascents will likely be around 500m to 800m, perhaps with the odd day ascending around 900m to 1000m.